Let me start out by saying I have never read the source material for Death Note. When I saw the trailer early this spring, I was immediately interested. I am in no way a fan of anime, so subtle changes to the story probably wouldn’t bother me much, anyway. The first thing I noticed was how rushed the movie seemed. I could tell fairly quickly that this story probably should have been told in a series format. I think six to ten 30-minute episodes would have served the story better. Instead, you get an hour-and-forty-minute film. Death Note is about high school student Light Turner, who is a highly intelligent social outcast. You have to figure that out in two scenes. I actually did not figure it out and had to research to figure out what those scenes were trying to convey. 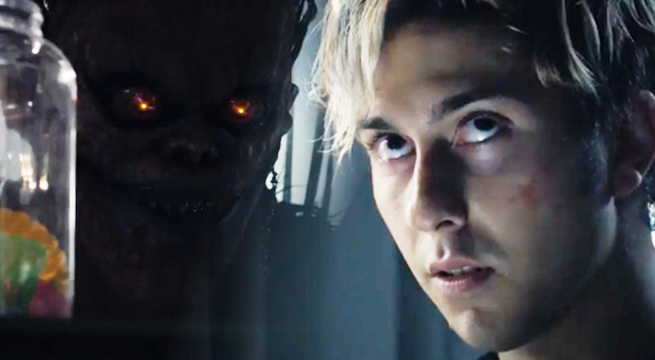 Light finds the Death Note and is soon visited by Ryuk, a god of death. I have no idea where he found the Death Note, that part isn’t actually shown. He is sitting in detention and then all of a sudden he just has it. Ryuk tells Light he can put anyone’s name in the book and the way they will die, having control of the person for up to 48 hours before their death. Light’s mother was killed by a drunk driver who got off completely free and extracts brutal revenge. Believing all people should be able to get the same justice he was able to extract, he starts the death cult of Kira with the help of his slightly insane girlfriend, Mia. His work is soon slowed down by genius detective L, who is determined to catch whoever is involved with Kira. The whole detective part of the movie made little sense. Who would even believe an actual person was committing crimes around the world? L, the detective, actually mentions the killer using remote viewing to commit the crimes. Sigh, really? Perhaps that fits in better in a longer-series version, because in this film, knowing the laws of how people get convicted for murder, there is no way Light would ever go to jail. The film never takes itself half as seriously as I did though, in my attempts to make the film more realistic. As I stated before, the film hangs between adult and childish expectations of a movie. The casting was superb and I can’t say enough great things about Willem Dafoe as Ryuk. Horror fans will mostly overlook the compressed story, due to the interesting and graphic deaths. I mean, there are only so many they can fit into the time allotted, but they are always fun to watch. The ending is also very well written and the best part of the film. I really think horror fans will enjoy this film. I have a feeling those who were in love with the anime version might not. If you can move past the writing’s shortcomings, the film is quite enjoyable for the death scenes, Defoe’s performance and the general idea behind the story. There is no way you leave this film and don’t take a moment to think who you would write down in the Death Note, if you were given the opportunity. It’s a great film to watch with a few people and talk about later. The film hangs somewhere between teenage horror film fodder and a more real adult film, with themes based on capital punishment and vigilante justice. Of course, for me, I’m watching the film thinking some people need killing. I don’t see a problem there, which is, of course, the opposite point the film is trying to convey. Perhaps it’s good Ryuk hasn’t visited me and offered me a Death Note. I give Death Note three-and-a-half stars for having the good sense to hire William Defoe and brutally fun death scenes.